How’s a Marketing Specialist’s workday? The company is a small one (for now) which means that you will play a huge part in the overall success and that you will always have a say in what’s going on. The company’s three brands are soon ready for launch after a massive revamp and they need you to create and execute a strategy to create customer relationships and to promote the new products. You will be delivering the company vision and strategy. By working with different technologies and being a part of the team, you will help to take the business to the next level. Finally, and most importantly, you will be a part in a start-up like environment where you can make a difference. Stakeholder input and expectations will be yours to manage, steer and influence. Engage with the team to formulate and present strategy, update on progress and develop new product features. Responsible for the Content strategy, content strategy implementation and content management and monitoring. Create and be responsible for executing an overall strategical marketing plan for the company and the products. Support but also improve the establishment of product vision, business goals, product roadmap and market expansion plans. Identify opportunities for future development and innovation. Who is our new Content Marketing Manager? Our dream candidate is a passionate gaming professional that’s been in the industry for a while but that burst of energy and ideas and want to bloom out. If you like solving problems, developing marketing strategies and working very ad-hoc and hands-on with daily operations are you the one we’re looking for! It’s considered a merit if you’ve been involved in the affiliate side of gaming in some way. Other interesting knowledge areas are VIP, campaigns, bonus features, game setups and casino features. Apart from being a bright marketing guy/gal, you’ll also need to have an analytical side and get excited when you analyse, track and summarize marketing activities and seeking to constantly improve where possible. Who is our new Marketing Specialist? 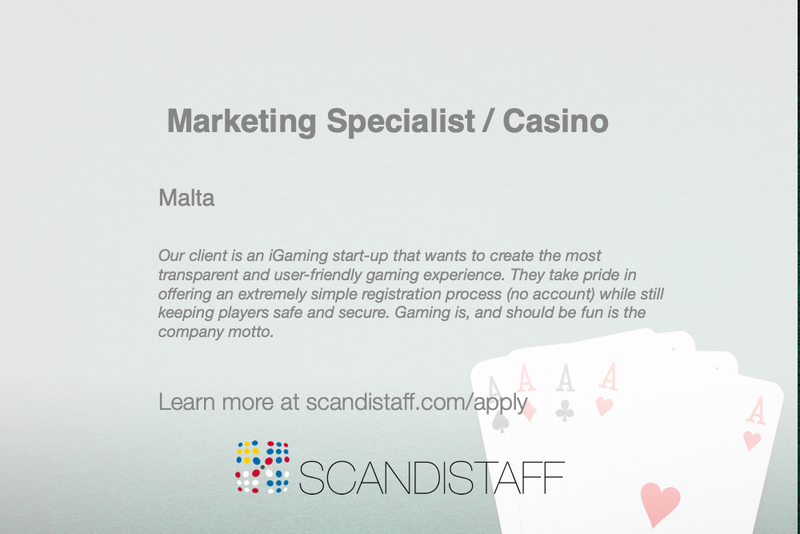 We believe that you have a couple of years of experience from the iGaming industry, preferably from an operator perspective. You will need to appreciate and enjoy data analysis as this will be used on a daily basis when it comes to game statistics and marketing data. It is considered a merit if you have been involved in affiliate management and worked with a platform like Netrefer or similar. We believe that you are a true “doer” that takes ownership of your role and don’t require/seek constant supervision. This is a start-up environment which demands maturity and excellent time management skills. You will need to master English apart from that are any Nordid language skills appreciated but in no way mandatory. Do you want to be the Marketing Specialist?